There are few things in sport more tasty than a well deserved late win and that's precisely what Real Madrid earned this Sunday night, as they visited Levante and beat the home side by 1-2. Cristiano Ronaldo scored the opener just a few moments after having been brutally elbowed in his eyebrow, while the "Canterano" Alvaro Morata untied the game deep in the 2nd half. Real Madrid fought bravely against Levante this last night and were rewarded with the 3 points, after a late header goal from Alvaro Morata. 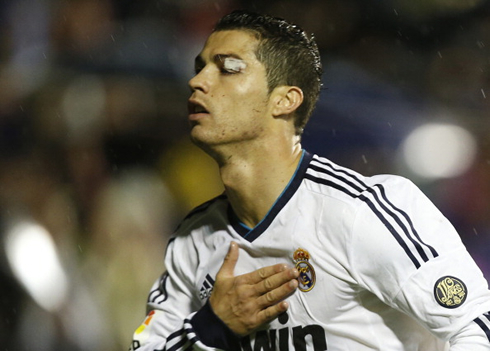 However, this match headlines won't be exclusively restricted to the tough Merengues victory, since Cristiano Ronaldo was also forced to leave the game at half-time, after receiving a savage elbow near his left eye, from Levante's defender David Navarro and only 3 minutes played in the clash. With his vision partially restored, the Portuguese forward resisted during the remaining minutes of the first half and incredibly, still found a way to put his name on the scoresheet, as he granted the lead to his side, before stepping out of the game after the first 45 minutes. In the 2nd half, Levante got the equaliser, but saw Alvaro Moratta stepping in from the bench to give Real Madrid the victory, close to the 84th minute. 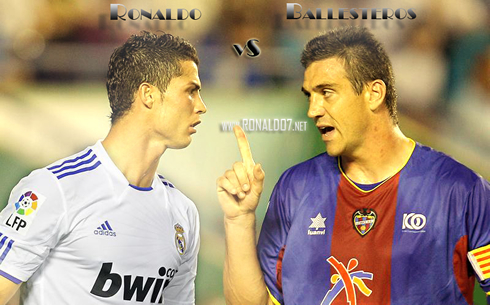 During this past week, a few Levante players insisted in warning Real Madrid that they could expect a big fight when the two teams clashed in the "Ciutat de València" stadium. The home side is known for their high aggressiveness levels, especially when playing at their home ground and let's say that the rainy weather taking place this Sunday in Spain, just gave them a valuable advantage to face a clearly more technical side, as it is the case of Real Madrid. Levante tried to show right from the start that they weren't going to play soft and their intimidation strategy crossed the line with still less than 4 minutes played in the game. 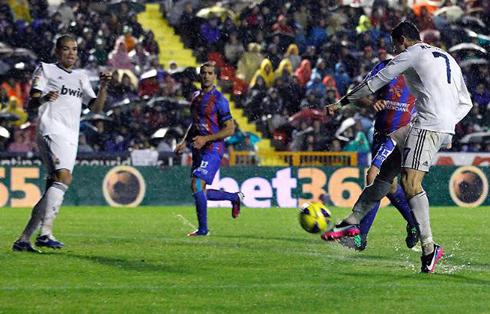 Pepe cleared away a ball towards Levante's half and aiming at Cristiano Ronaldo's direction. As two defenders immediatly approached CR7 to jump to the ball, Ronaldo stepped away in order to avoid an unnecessary challenge in the air. What the Portuguese star wasn't counting with was David Navarro's brutality, as the Levante defender intentionally raised his right elbow in the moment he jumped, in a clear attempt to hit Cristiano Ronaldo in the head. 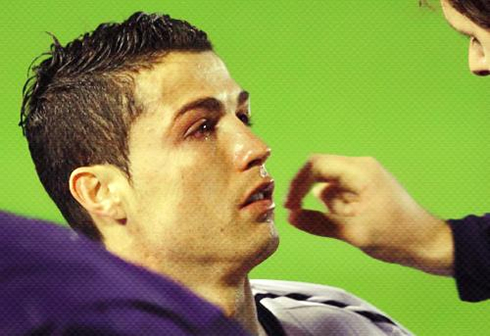 The blow knocked Ronaldo to the ground, opening a big cut on his left eyebrow. The Real Madrid forward was assisted by doctors during a few minutes, returned to the game with his left eye partially closed and for everyone's surprise, he would still score the opener despite his half blindness! With 21 minutes on the clock, Xabi Alonso made a long cross from a free-kick on the left that Pepe and David Navarro jumped to intercept it. However, the Levante defender's touch sent the ball only a couple of meters away, precisely near Cristiano Ronaldo area of action. With one eye half closed, CR7 controlled the ball with his right thigh and blasted a powerful shot into the back of the net, making it 0-1 for Real Madrid. Levante's initialy strategy of intimidating Ronaldo and putting him away of the game had failed, as the Real Madrid number 7 fired back with a goal as his response. Both teams headed back to the dressing rooms knowing that Ronaldo's goal had made the difference during the first 45 minutes, but as the two sides stepped back after the break, Ronaldo was left inside and got replaced by Raúl Albiol. According to José Mourinho's statements granted straight after the game, the Portuguese forward had lost part of the vision in both eyes during half-time and was showing clear signs of dizziness. It has also been said that Ronaldo is expected to go to the hospital in Madrid and do a full round of exams in order to know the full extent of this injury. We can certainly expect news on his physical condition by this Monday. Now, returning to the game, Ronaldo's injury and replacement by Albiol led to a few tactical changes that the home side took advantage of. Levante managed to reach the equalizer near the 62th minute, after a good assist from Obafemi Martins, who chipped the ball above Pepe and allowed his teammate Angel, to strike the ball past Iker Casillas. Things weren't looking promising for Real Madrid at that stage, with Ronaldo out of the action and a home side revitalized by the long awaited goal, as well as a heavy pitch suitable for their typical physical game. The Merengues reacted well and they can thank a fresh Kaká, who made a strong impact on the game, short moments after he came in. With 73 minutes played, José Mourinho's men were awarded with a penalty-kick decision that could have allowed the visiting side to restore the lead, but without Ronaldo on the pitch, someone else had to assume the responsability. It was then Xabi Alonso who stepped up, but unfortunately, his shot was saved by Munúa and once again the game seemed destined to go into Levante's favor. As time kept passing, hopes of still pulling off the 3 points also started decreasing. The possibility of dropping valuable points this Sunday night was gaining more and more shape, with the immediate consequence of allowing Barcelona to extend the points gap in La Liga standings into a two-digit difference. However, Real Madrid got back to the title run in fashion, thanks to a header goal from Alvaro Morata, a "Canterano" (player developped in Real Madrid youth system) who had just made his first touch in the game! Levante wouldn't react to that late blow and Real Madrid secured the 3 points, assuring that Barcelona's getaway attempt wouldn't go past the 8 points. 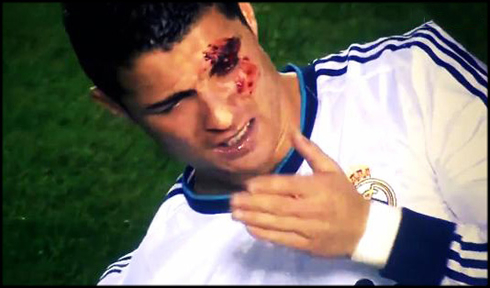 As for Cristiano Ronaldo, his eye injury will be reassessed this Monday (12th of November, 2012) and there should be an update on his condition and estimated recovery time during the day. Cristiano Ronaldo next game for Real Madrid will be against Athletic Bilbao, for the Spanish League "La Liga", next Saturday (17-10-2012). In the meantime, you can watch Gabon vs Portugal, Panama vs Spain, Sweden vs England, and Houston Rockets vs Miami Heat, all matches provided from our soccer live section.